Spent last week on the South Coast of England. Popped over to Christchurch for a beach walk but insanely high winds drove me to shelter in the shadows of the trees like Gollum. Lurking in the dark I spotted this intrepid dog walker. I really enjoy your work!! 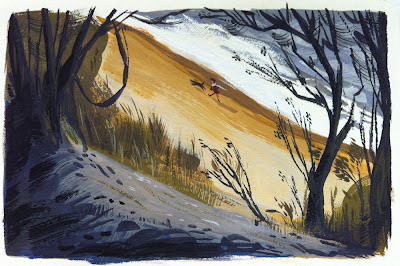 the Gouache Sketches are also very inspiring. do you ever do exhibitions? Charley Harper has found his successor....beautiful work! !